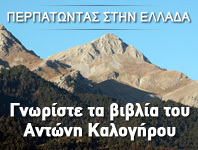 Other features: An introduction to the Kalymnian landscape, flora, fauna, history and archeological sites, with practical advice on hiking on the island. 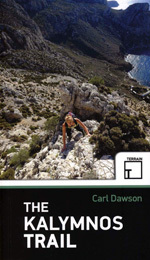 A detailed description of the Kalymnos Trail in a series of 10 full-day or half-day hikes. Maps based on the most up-to date Terrain 1:25.000 series. A description of 16 additional walks and hikes on the island. Size: H 20 Χ W 12 cm. The ''Kalymnos Trai''l is a multi-day 100km trekking route around the Greek island of Kalymnos in the South Aegean. The route links many of the most interesting places on the island mountain tops and monasteries, cliffs and castles, beaches and Byzantine ruins. None will forget the exceptional combination of blue ocean and rugged limestone mountains of this journey. This is, however, not a book for the casual stroller, the route is tough and hard. The Trail passes through complex terrain and is best suited to those with experience of hiking and scrambling in mountain environments.